Cleanroom Ultrapure Fogger produces ahigh volume of ultrapure fog needed in clean rooms, sterile rooms and ISO roomsat 5 cubic meters per minute (170 cubic feet / minute) for up to 90 minutes,which easily visualizes airflow for 20-30 feet distance; surpassing all otherultrapure foggers in use today…for less cost. Patterns of air flow, turbulence and velocity can be viewed with anon-contaminating fog; thus no clean up is required. The AP32 ultrapure foggenerator is used in Semiconductor and Pharmaceutical companies to visualizeairflow patterns, turbulence, find dead zones, see direction and visualizevelocity. 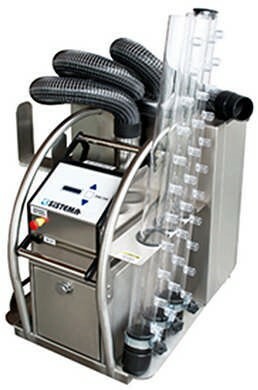 The ultrapure fogger provides a very dense fog by generating vaporfog droplets at 2-3 micron diameter, permitting the fog to travel much furtherin the air stream. As the fog evaporates, it reverts back to the same elementswe breathe. The exit temperature of the fog is about 78 Fdegrees with a very low exit pressure, ensuring a neutrally buoyant fogentering the airflow. The high purity fog floats into the airflow, rather thandropping as with ultrasonic foggers. A polycarbonate Fog Tube and long,flexible, 15 foot, (5M) Fog Hose is provided. The ultrapure fogger rolls easilyacross a floor with wheel casters underneath. A front storage drawer isprovided. ·Very High Fog Density:Providing from 20-30 feet visible airflow distance. ·Highest Fog Volume:5 Cubic Meters (170 CF) per minute for 90 minutes. ·Low Fog Exit Pressure:No fog entry turbulence is created. ·Ultrapure Fog, SS Enclosure:No cleanup required, no contamination to fog or clean room. ·Neutrally Buoyant Fog :Fog floats into airflow without dropping. ·Video Capabilities:Video of the airflow turbulence is very easy with dense fog. ·Fog Curtain Wand:Optional Fog Curtain Wand to spread out the fog visibility. ·Fog IIIumination:Optional Blue LED Fog IIIuminator to contrast airflow. Fog purity is achieved by bringing DI water to boil creating an ultrapure water vapor. The DI water vapor is then combined with LN2 (LNG) liquid nitrogen, which boils at room temperature. The two vapors combine to form a highly dense, ultrapure fog to visualize airflow, patterns and turbulence in clean rooms, ISO suites and sterile rooms. The fog generated is the highest volume, highest density, highest purity to visualize airflow and turbulence. The fog is neutrally buoyant, thus when entering the airflow, the fog travels with the airflow, rather than dropping in the airflow, as with ultrasonic foggers that produce lower temperature fog outputs. The high purity fog offers no exit turbulence to the airflow being visualized due to a low exit pressure. The AP32, Cleanroom Ultrapure Fogger fog leaves no contamination behind; requiring no cleanup after fog operations. The very high fog density increases the airflow visualization distance. The Stainless Steel enclosure contains the liquid nitrogen in a Dewar and holds the DI water in a separate boiler, ensuring a durable design. The AP32 is CE Mark, meets guidelines for ISO 14644-3 ANNEX B7 and USP 797 Insitu Airflow Analysis. Visualize airflow patterns around equipment, tools, hallways, door entries and personnel. Balance airflow pressure on two sides of a closed clean room or ISO suite. Locate standing vortices that can transport particle contamination into critical work areas and sterile rooms. Visually track air flow direction and velocity to ensure air flow balance between clean rooms, ISO suites and sterile rooms. Detect unwanted air infiltration into a clean room to verify process environments are operating properly. The Apollo 32, AP32, Ultrapure Fog Generator produces a very dense, ultrapure fog, providing superb visual & video observations, making it the very best clean room fogger available today. A Blue LED Wide Fog Curtain Illuminator is available to contrast and highlight airflow turbulence.